Gina Melekh worked with the City of Baltimore to develop a Strategic Energy Management Plan. Gina Melekh was asked to work with the City of Baltimore Energy Office to write a Strategic Energy Management Plan for the city government. These strategies and goals support and expand existing sustainability efforts by Baltimore city government, establishing a long-term energy management vision extending to 2050. The City is responsible for over 1,000 facilities and structures and 3,000 vehicles. Working with numerous stakeholders, Melekh proposed seven ambitious goals accompanied by over fifty action items and a framework for monitoring and reporting. The goals include reductions in greenhouse gas emissions, electricity and fuel use, 40 megawatts of renewable energy capacity to be used by city facilities and a commitment to adopt a water conservation plan. Also, the document puts forward an energy resilience goal to support disaster preparedness initiatives and a pledge to foster energy efficiency among small businesses and non-profits serving low-income communities. Melekh presented the plan to the Baltimore Sustainability Commission where it was strongly endorsed. The Strategic Energy Management Plan was presented to multiple stakeholders, including the Baltimore City Mayor Rawlings-Blake and Senior Staff. In December 2014, the Baltimore Sustainability Commission voted and unanimously approved the Plan which made the document official city policy. 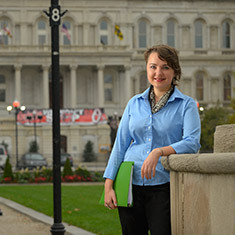 Gina Melekh, a student at Presidio Graduate School, was hired as the 2014 EDF Climate Corps fellow at City of Baltimore.